Classy in College: Byebye wristlets! Going out bags...Tons of girls use Coach wristlets when they go out and stuff them with lip gloss, phone, money, credit cards and literally anything that will fit in there (which is nothing)! And then the wristlet looks misshapen and slightly ridiculous. Not only do outfits need to be edited, but also our purse contents! Anyhoo, my godmother sent me the sweetest birthday box and in it was my new going out bag! Over the shoulder bags are totally coming back into fashion- they haven't really been cool since sometime in the 90's- and they work so much better for going out! I love the equesterian-looking Cole Haan bag, but it's definitely still got some class (hello, gold chain). The leather is a different color than pictured, I have a hunting-ish green. 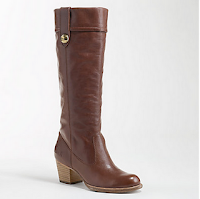 But they will go perfectly with the boots I got on Black Friday...so many new outfits! Not to say some Cornell girls have style, but a lot of girls are carrying over the shoulder bags when they go out. I have noticed a lot of vintage Dooney and Bourke and newer Louis's over the shoulder bags. You can get a great steal on these bags at consignment and vintage stores. 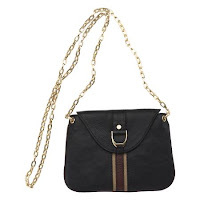 I love my Dooney one, it is so convenient and it actually looks cute with a lot of my winter night outfits. I want to find a lighter and funner one for the summer, my current one is pretty dark brown. I am trying to find a picture, I will post it soon. I just wanted to point out some personal reasons why over the shoulder bags make so much more sense for going out and why every classy girl should have one. 1. All your important is safe, you do not have to worry about losing anything or even your bag because it's on you. 2. It looks cute and stylish - fashion forward - other girls on campus will eventually pick up the new trend(next semester) when they see you at the bars. 4. As a classy college girl, it gives you two completely free hands to do whatever you want all night!